That kind of thinking makes transportation an elephant in the room for U.S. environmentalists, Baca says, and shifting to electric vehicles won’t be enough on its own to solve the problem if Americans don’t bring down their per capita vehicle miles travelled. 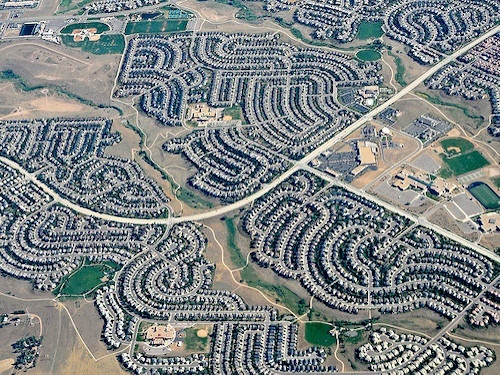 “Sprawl requires us to spend more time and more money to reach the places we need to go,” she notes, and the distance from home to work is a particular problem for the communities of interest the Green New Deal sets out to empower and support. The plan moves beyond the climate movement’s more traditional and limited focus on technologies and markets, with its emphasis on environmental justice and community resilience and its support for “old-fashioned public investment” that has been “something of a taboo” in neoliberal circles. “Public investment with the returns going back to the public—it’s not a GND without that,” he writes. But he also points to two gaps: An early draft of the resolution left out any reference to the rapid electrification that will be needed to decarbonize the U.S. economy. And the final version makes only passing, incomplete reference to urban density and public space. Baca says the process of changing out the built environment can begin right away, and “the good news is that if we do account for land use, we will get much closer to a safe, sustainable, and resilient future.” With a national deficit of 7.2 million affordable, available rental units for U.S. families most in need, according to the National Low Income Housing Coalition, the critical question is whether those units will be built near transit, or in inaccessible suburbs. While that discussion unfolds, Roberts points to the distinct possibility that the Green New Deal will become a process of dreaming big and negotiating down. “It is all to the good that a muscular progressive movement is rallying behind a program shaped by the problem at hand rather than speculation about what is politically possible,” he writes. “It is good to start from a position of strength.” But “given the two-year time window to get legislation ready and the 10-year time window to kick-start multiple decarbonization revolutions, the chances of pulling off a full-scale political revolution beforehand seem remote,” particularly given some of the broader social goals incorporated in the resolution.